Visual complications following stroke and other forms of acquired brain injury occur in up to 60% of all patients. These can occur in isolation or as a combination of visual complications such as central vision loss, visual field loss, visual inattention, eye movement disorders, visual perceptual difficulties. 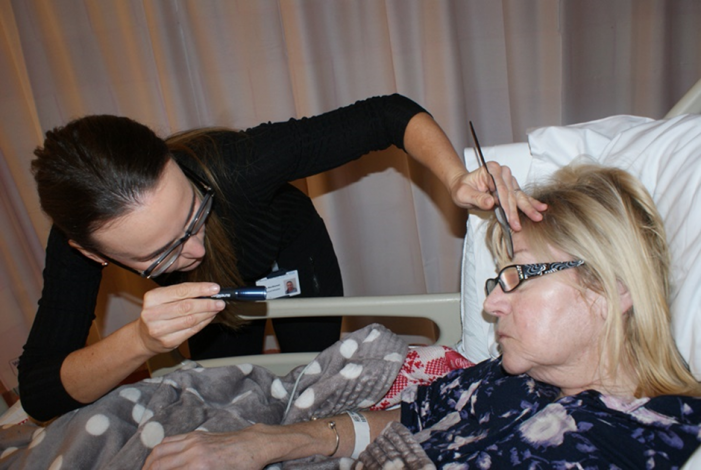 If these visual complications are not identified and not treated they can cause problems with the rehabilitation, potentially increase the patient’s length of stay in hospital, increase falls and reduce independence. Orthoptists are experts in the assessment of these complex cases and are able to assess patients at bedside or in the Out patients department within Ophthalmology.Orthoptists can assess the visual function in almost all patients including those with poor cognition and communication difficulties. The Orthoptic service at Warrington and Halton Hospitals NHS Foundation Trust provide specialist assessment to all patients who are known to have had a stroke. We also accept referrals for any patients who have neurological impairment and are having difficulties with their vision. We provide a full Orthoptic investigation, diagnosis and treatment and/or advice. Patients who require further investigation will be referred to an appropriate Ophthalmologist. The Orthoptist can liaise with community and hospital optometrists to ensure patients are wearing their correct and up to date glasses prescription. Those patients who require support from the Vision Impairment Team in the community will be referred immediately by the Orthoptist. If a patient is in hospital after a stroke the Orthoptic team will aim to see them within 5 days. For all other referrals the Orthoptic team aim to see all patients within 4 weeks as an Out-patient within our Ophthalmology department at Warrington. Reasonable adjustments will always be accommodated. For those who are unable to attend the hospital if they are house bound are offered a home visit. “Vision Passport” detailing what was found and advice and treatment given.This leaflet can be helpful for families and carers to understand the visual impairment and what they can do to help. All patients on the Stroke Ward (B14) and who have a diagnosis of stroke will be automatically assessed by the Orthoptic team when they are medically able. Community referral form - click here. There are a number of useful websites that can provide further information including patient information leaflets.